The House of Dunkeld, in Scottish Gaelic Dùn Chailleann (meaning Fort of the Caledonii or of the Caledonians), is a historiographical and genealogical construct to illustrate the clear succession of Scottish kings from 1034 to 1040 and from 1058 to 1286. 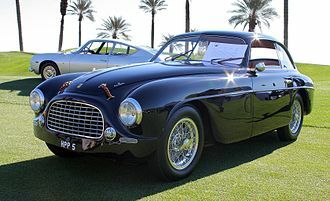 The line is also variously referred to by historians as "The Canmores", and "MacMalcolm". Sir Iain Moncreiffe made the case that Crínán of Dunkeld actually belonged to a Scottish sept of the Irish Cenél Conaill royal dynasty, a branch of the Uí Néill. Christopher Cairney makes the case for a different Uí Néill descent in the Cenél nEógain. This does not exclude Crínán's descendants from also being a (female line) continuation of the Cenél nGabráin through Bethóc. The Dunkeld dynasty is genealogically based on Duncan I of Scotland being of a different agnatic clan to his predecessor and maternal grandfather Malcolm II of Scotland. However, sociohistorically, the reign of Duncan's son Malcolm III of Scotland, which happens to coincide with the start of the centuries-long period of strong influence from the southern neighbour, the Kingdom of England, has been seen as a more important place to start. During the time of House of Dunkeld, succession to the Scottish throne evolved towards primogeniture instead of the Irish-Celtic tradition of tanistry and the Pictish traditions (whether they were matrilineal or not). Although the contemporaries did not have a common name for these monarchs, they were a family who formed a hereditary kingship. Scotland was more influenced by outlanders than it had been earlier, or was to be under the kings of the House of Bruce and House of Stuart. 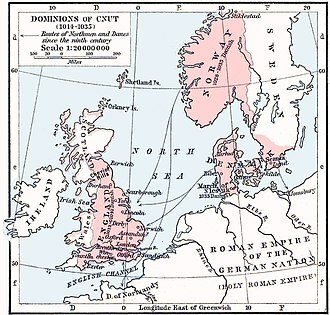 The kingdom was between two established powers: the Kingdom of England and Norway. The common goal uniting the usual policies of kings of this dynasty was to balance between the two neighbours, sometimes allying to have some outside support (France in the Middle Ages). Wars were fought on both fronts, but also alliances and treaties were made with both. Many Norman lords and institutions were brought to Scotland, especially after the Norman conquest of England; by the end of the period, both had been in Scotland for centuries. The tribal polity evolved to a medieval feudal society, adopting legal traditions from Rome, and the elite evolved to become broadly "Frankish" in custom, a change strengthened by the immigration of (Anglo-Saxon) English, Normans and French. The Dunkeld dynasty rose to rule in a time when the kingdom was fragmented, under increasing outside threats, and some monarchs started to initiate more centralized government. The Dunkelds came to power after the two centuries of civil unrest under the House of Alpin. The first king of this new dynasty was Malcolm III of Scotland who determined that succession would be to the eldest son, not according to the rules of tanistry. This political decision reduced the conflicts inside the Royal family. The Dunkelds consolidated Scotland's' union and independence as a kingdom, despite several skirmishes with the neighbouring England. The fall of the House of Dunkeld began in 1286, when Alexander III died in a horse riding accident. The king had no living sons, only one three-year-old granddaughter, Margaret, princess of Norway. Fearing the influence of king Eric II of Norway, her father, and another endless civil war, the Scottish nobles appealed to Edward I of England. 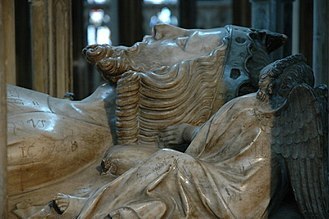 Margaret was betrothed to the future Edward II of England, but died shortly afterwards on her arrival to Scotland. The dynasty ended at a time when immigrant-originated feudal families had reached material level almost as high as the kings and the beneficiaries of feudal system desired to better guarantee their positions, rights and properties - even at the cost of national independence. Following the end of the Dunkelds, Scotland fell in the First Scottish War of Independence against England. On Alexander III's death his granddaughter Margaret (Maid of Norway) was recognised as "right heir", as had been agreed in Alexander's lifetime, but she was never inaugurated as Queen of Scots. ^ Windsor, Grace Scottish Monarchs: The House of Dunkeld, 1093 - 1286, Including Donald III, Duncan II, Alexander I, II and III, David I and More.2011. ^ Cairney, Christopher (2018). "Other Dragons or Dragon Others? A Cultural View of the Loch Ness Monster". Monsters of Film, Fiction and Fable: 397. ISBN 9781527510890. The Wars of Scottish Independence were a series of military campaigns fought between the Kingdom of Scotland and the Kingdom of England in the late 13th and early 14th centuries. The First War began with the English invasion of Scotland in 1296, the Second War began with the English-supported invasion by Edward Balliol and the Disinherited in 1332, and ended in 1357 with the signing of the Treaty of Berwick. The wars were part of a crisis for Scotland and the period became one of the most defining times in its history. At the end of wars, Scotland retained its status as an independent state. 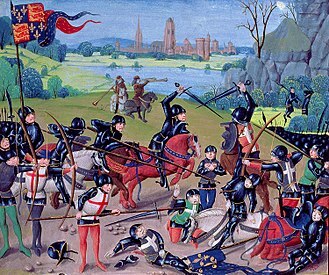 The wars were important for reasons, such as the emergence of the longbow as a key weapon in medieval warfare. King Alexander III of Scotland died in 1286, leaving his three-year-old granddaughter Margaret as his heir. In 1290, the Guardians of Scotland signed the Treaty of Birgham agreeing to the marriage of the Maid of Norway and Edward of Caernarvon, the son of Edward I, who was Margarets great-uncle. However, travelling to her new kingdom, died shortly after landing on the Orkney Islands around 26 September 1290, with her death, there were 13 rivals for succession. The two leading competitors for the Scottish crown were Robert Bruce, 5th Lord of Annandale and John Balliol, Edward agreed to meet the guardians at Norham in 1291. Before the process got underway Edward insisted that he be recognised as Lord Paramount of Scotland, when they refused, he gave the claimants three weeks to agree to his terms, knowing that by his armies would have arrived and the Scots would have no choice. Edwards ploy worked, and the claimants to the crown were forced to acknowledge Edward as their Lord Paramount and accept his arbitration. Their decision was influenced in part by the fact that most of the claimants had large estates in England and, however, many involved were churchmen such as Bishop Wishart for whom such mitigation cannot be claimed. Two days later, in Upsettlington, the Guardians of the Realm, all Scots were required to pay homage to Edward I, either in person or at one of the designated centres by 27 July 1291. The son of a deceased elder brother inherits before a living younger brother by right of substitution for the deceased heir. In the absence of any children, brothers succeed, among siblings, sons inherit before daughters. The principle has applied in history to inheritance of property as well as inherited titles and offices, most notably monarchies. Variations on primogeniture modify the right of the son to the entirety of a familys inheritance or, in the West since World War II. 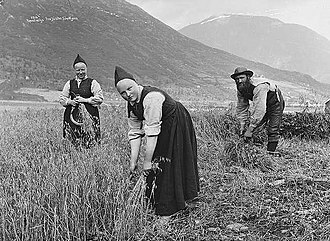 Most monarchies in Europe have eliminated male preference in succession, Denmark, Netherlands, Sweden, equal, or lineal primogeniture is a form of primogeniture in which gender does not matter for inheritance. This form of primogeniture was not practiced by any modern monarchy before 1980, according to Poumarede, the Basques of the Kingdom of Navarre transmitted title and property to the firstborn, whatever the gender. This inheritance practice was adhered to by the nobility and free families alike in the early. The Navarrese monarchy, was inherited by dynasties from outside of Navarre which followed different succession laws, eventually only the Basque lower nobility and free families of the Basque country and other regions continued to follow this practice, which persisted as late as the 19th century. The most notable of these are the Egyptian cases of Hatshepsut and Thutmose III, as well as the Ptolemaic Dynastys kings, Zapateros proposal was supported by the leader of the main opposition party, the conservative Partido Popular, making its passage likely. However, Zapateros administration ended before any amendment was drafted, Felipe succeeded to the throne as Felipe VI, upon his fathers abdication in 2014, by which time he had two daughters. Felipe VI has no son that would, absent the constitutional change, in July 2006, the Nepalese government proposed adopting absolute primogeniture, but the monarchy was abolished in 2008 before the change could be put into effect. In 2011, the governments of the 16 Commonwealth realms who share the person as their respective monarch announced the Perth Agreement. This was implemented when the legislation came into effect on 26 March 2015. In Japan, debates have occurred over whether to adopt absolute primogeniture, the birth of Prince Hisahito, a son of Prince Akishino has sidelined the debate. Clan Bruce is a Scottish clan from Kincardine in Scotland. It was a Royal House in the 14th century, producing two kings of Scotland, the surname Bruce comes from the French de Brus or de Bruis, derived from the lands now called Brix, situated between Cherbourg and Valognes in Normandy, France. There is no evidence to support a claim that a member of the family, Robert de Brix and this notion is now believed to have originated in unreliable lists, derived from the Middle Ages, of people who supposedly fought at the Battle of Hastings. Both the English and Scots lines of the Brus/Bruce family demonstrably descend from Robert de Brus, Robert de Brus was a companion-in-arms of Prince David, David I of Scotland. 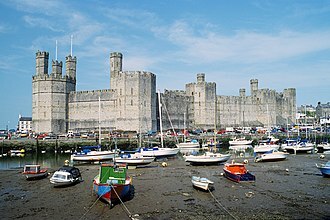 In 1124 he followed David north to reclaim his kingdom, when a civil war broke out in England between Empress Matilda and her cousin, David I of Scotland led a force into England. However de Brus did not follow David and instead joined the English and at the Battle of the Standard in 1138 he took prisoner his own son, Robert de Brus, 1st Lord of Annandale died on 11 May 1141 and was buried at Gysburn. The union brought both great wealth, with the addition of lands in both England and Scotland and their son, Robert Bruce, 5th Lord of Annandale, known as the competitor was sometime Tanist to the throne. On the death of Alexander III of Scotland both Bruce and John Balliol claimed succession, Alexanders infant granddaughter was named as heir, she died in 1290 travelling to Scotland to claim her throne. Edward I saw this as the opportunity he had long waiting for to conquer Scotland as he had conquered Wales. In 1292 Edward chose Balliol who swore allegiance to the English monarch and it was not long, before Balliol rebelled against Edward, eventually leading to Johns defeat and forced abdication after the Battle of Dunbar in 1296. With the abdication of John Balliol, Scotland was effectively without a monarch, Robert the Bruce swore allegiance to Edward at Berwick-upon-Tweed but breached this oath when he joined the Scottish revolt the following year. In the summer of 1297 he again swore allegiance to Edward in what is known as the Capitulation of Irvine, Bruce, it seems, was seen as a man whose allegiance might still be won. Margaret, Maid of Norway was a Norwegian princess who reigned as Queen of Scots from 1286 until her death. 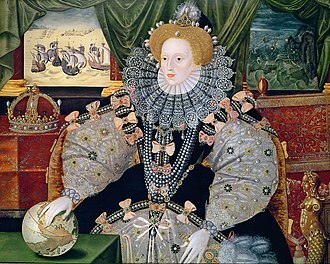 Her death while travelling to Scotland sparked off the disputed succession led to the Wars of Scottish Independence. She was the daughter of King Eric II of Norway and Margaret, or she, even if she is without children, according to Scottish law and custom. 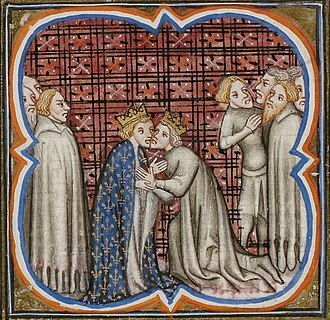 Alexander III made similar provisions when arranging the marriage of his son Alexander to Margaret, daughter of Guy de Dampierre, Count of Flanders, probably in 1281. The treaty arranging the marriage, signed in December 1281, included a lengthy and complex document setting out the customs, as well as general statement of principles, the annex includes specific examples of the rights of A and M and their children in particular cases. The document, while confusing in places, appears to favour primogeniture for male heirs, or their descendants, the younger Alexander died on 28 January 1284, leaving only the kings granddaughter Margaret living out of his descendants. Alexander III summoned all thirteen earls of Scotland and twenty-four barons, however, it is unlikely that this was intended to allow Margaret to rule alone as queen regnant, but rather jointly with her future spouse, whoever he might be. While unexceptional in the circumstances, this would appear to show that Alexander III had decided on remarriage and he did remarry, to Yolande de Dreux, but died shortly afterwards as the result of an accident on 19 March 1286 without any children by her. At this time it was thought that Queen Yolande was pregnant, so that Margaret was not yet the obvious successor. This, according to the oaths taken, made Margaret the heir at three years of age, but that same year Robert Bruce, 5th Lord of Annandale had rebelled with the aid of his son the Earl of Carrick. The Bruces captured strongholds in Galloway, and as well as bolstering their position in the south-west where their rivals the Balliols had influence, may have been making a bid for the Crown. The rebellion thus quickly fizzled out, though no action was taken against the Bruces after they had handed back the castles they had seized. Scottish Gaelic or Scots Gaelic, sometimes referred to as Gaelic, is a Celtic language native to Scotland. A member of the Goidelic branch of the Celtic languages, Scottish Gaelic, like Modern Irish and Manx, developed out of Middle Irish. The 2011 census of Scotland showed that a total of 57,375 people in Scotland could speak Gaelic at that time, the census results indicate a decline of 1,275 Gaelic speakers from 2001. A total of 87,056 people in 2011 reported having some facility with Gaelic compared to 93,282 people in 2001, only about half of speakers were fully literate in the language. Nevertheless, revival efforts exist and the number of speakers of the language under age 20 has increased, Scottish Gaelic is neither an official language of the European Union nor the United Kingdom. Outside Scotland, a group of dialects collectively known as Canadian Gaelic are spoken in parts of Atlantic Canada, mainly Nova Scotia and Prince Edward Island. In the 2011 census, there were 7,195 total speakers of Gaelic languages in Canada, with 1,365 in Nova Scotia and Prince Edward Island where the responses mainly refer to Scottish Gaelic. About 2,320 Canadians in 2011 claimed Gaelic languages as their mother tongue, with over 300 in Nova Scotia, aside from Scottish Gaelic, the language may be referred to simply as Gaelic. In Scotland, the word Gaelic in reference to Scottish Gaelic specifically is pronounced, outside Ireland and Great Britain, Gaelic may refer to the Irish language. Scottish Gaelic should not be confused with Scots, the Middle English-derived language varieties which had come to be spoken in most of the Lowlands of Scotland by the modern era. Prior to the 15th century, these dialects were known as Inglis by its own speakers, from the late 15th century, however, it became increasingly common for such speakers to refer to Scottish Gaelic as Erse and the Lowland vernacular as Scottis. Today, Scottish Gaelic is recognised as a language from Irish. Gaelic in Scotland was mostly confined to Dál Riata until the 8th century, when it began expanding into Pictish areas north of the Firth of Forth, by 900, Pictish appears to have become extinct, completely replaced by Gaelic. Tanistry was a Gaelic system for passing on titles and lands. The Tanist was chosen from among the heads of the roydammna or righdamhna or, among all males of the sept, the eligibility was based on patrilineal relationship, which meant the electing body and the eligibles were agnates with each other. The composition and the governance of the clan were built upon male-line descent from a similar ancestor, the office was noted from the beginning of recorded history in Ireland, and probably pre-dates it. A story about Cormac mac Airt refers to his eldest son as his Tanist, following his murder by a member of the Deisi, another roydammna, Eochaid Gonnat, succeeded as king. In Ireland, the tanistry continued among the dominant dynasties, as well as lords and chieftains. When in 1943 Ireland appointed its first new Chief Herald, it did not reintroduce tanistry, the state granted courtesy recognition to Irish chiefs based on primogeniture from the last known chief. The Gaels exported tanistry and other customs to those parts of Scotland which they controlled after 400 CE, the Picts, did not share the succession principles of their neighbours of Ireland and Scottish Gaels. 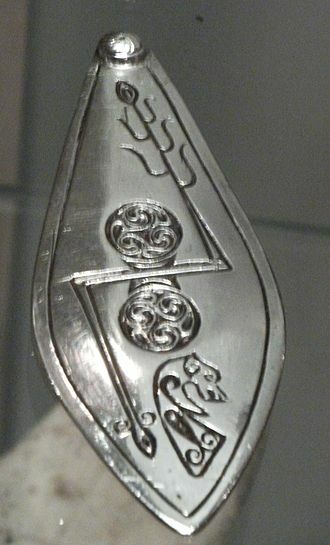 No female succession, or male succession via female lines, is allowed in the Irish, by contrast, Pictish succession often used links through females. The royal succession in Celtic Scotland was limited to the elective agnatic or male line of the Siol Alpein until the accession of King Malcolm II in 1005 and this monarch was the first to introduce the concept of hereditary monarchy in Scotland. He did so to try to eliminate the strife caused by the elective law, since Malcolm had only daughters, he introduced the right of female-line succession in Scotland. This gave rise to conflict by competitors for generations thereafter, the Irish monarchies never at any stage allowed for female line succession, a position which is maintained to the present day. The Tanist held office for life and was required by custom to be of age, in possession of all his faculties. At the same time, and subject to the conditions, a tanist or next heir to the Monarchy was elected. The usual rules for qualification as a roydammna was that a candidate had to be a member of the Derbfhine, a kindred all descended in the male line from a common ancestor. From the 13th century on, the state slowly regained control of a number of these lost powers. The crises of the 13th and 14th centuries led to the convening of an assembly, the Estates General. From the Middle Ages onward, French rulers believed their kingdoms had natural borders, the Pyrenees, the Alps and this was used as a pretext for an aggressive policy and repeated invasions. The belief, had little basis in reality for not all of territories were part of the Kingdom. France had important rivers that were used as waterways, the Loire, the Rhone and these rivers were settled earlier than the rest and important cities were founded on their banks but they were separated by large forests and other rough terrains. Before the Romans conquered Gaul, the Gauls lived in villages organised in wider tribes, the Romans referred to the smallest of these groups as pagi and the widest ones as civitates. These pagi and civitates were often taken as a basis for the imperial administration and these religious provinces would survive until the French revolution. 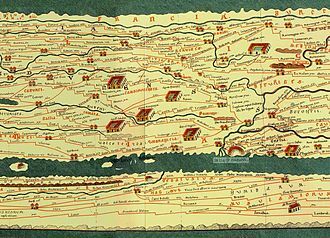 Discussion of the size of France in the Middle Ages is complicated by distinctions between lands personally held by the king and lands held in homage by another lord, the domaine royal of the Capetians was limited to the regions around Paris and Sens. The great majority of French territory was part of Aquitaine, the Duchy of Normandy, the Duchy of Brittany, the Comté of Champagne, the Duchy of Burgundy, and other territories. Philip II Augustus undertook a massive French expansion in the 13th century, only in the 15th century would Charles VII and Louis XI gain control of most of modern-day France. The weather in France and Europe in the Middle Ages was significantly milder than during the preceding or following it. Historians refer to this as the Medieval Warm Period, lasting from about the 10th century to about the 14th century, part of the French population growth in this period is directly linked to this temperate weather and its effect on crops and livestock. At the end of the Middle Ages, France was the most populous region in Europe—having overtaken Spain, in the 14th century, before the arrival of the Black Death, the total population of the area covered by modern-day France has been estimated at around 17 million. Malcolm was King of the Scots from 1005 until his death. He was a son of King Kenneth II, the Prophecy of Berchán says that his mother was a woman of Leinster and refers to him as Forranach, to the Irish annals which recorded his death, Malcolm was ard rí Alban, High King of Scotland. Malcolm II was born to Kenneth II of Scotland and he was grandson of Malcolm I of Scotland. In 997, the killer of Constantine is credited as being Kenneth, son of Malcolm. 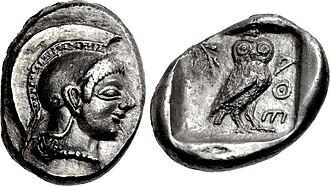 Since there is no known and relevant Kenneth alive at that time, it is considered an error for either Kenneth III, who succeeded Constantine, or, Malcolm himself, the son of Kenneth II. Whether Malcolm killed Constantine or not, there is no doubt that in 1005 he killed Constantines successor Kenneth III in battle at Monzievaird in Strathearn. John of Fordun writes that Malcolm defeated a Norwegian army in almost the first days after his coronation, Fordun says that the Bishopric of Mortlach was founded in thanks for this victory over the Norwegians. Malcolm demonstrated an ability to survive among early Scottish kings by reigning for twenty-nine years. He was a clever and ambitious man, brehon tradition provided that the successor to Malcolm was to be selected by him from among the descendants of King Aedh, with the consent of Malcolms ministers and of the church. First he married his daughter Bethoc to Crinan, Thane of The Isles, head of the house of Atholl and secular Abbot of Dunkeld, his youngest daughter, Olith, to Sigurd, Earl of Orkney. His middle daughter, was married to Finlay, Earl of Moray, Thane of Ross and Cromarty and a descendant of Loarn of Dalriada. He defeated the Angles at Carham in 1018 and installed his grandson, son of the Abbot of Dunkeld and his choice as Tanist, in Carlisle as King of Cumbria that same year. 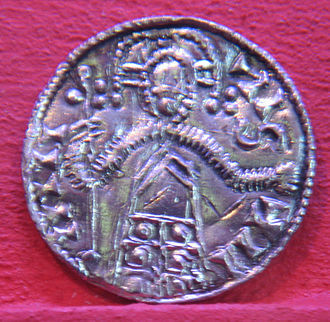 The first reliable report of Malcolm IIs reign is of an invasion of Bernicia in 1006, perhaps the customary crech ríg, which involved a siege of Durham. This appears to have resulted in a defeat by the Northumbrians, led by Uhtred of Bamburgh, Earl of Bernicia. Rome is a special comune and the capital of Italy. Rome serves as the capital of the Lazio region, with 2,873,598 residents in 1,285 km2, it is the countrys largest and most populated comune and fourth-most populous city in the European Union by population within city limits. It is the center of the Metropolitan City of Rome, which has a population of 4.3 million residents, the city is located in the central-western portion of the Italian Peninsula, within Lazio, along the shores of the Tiber. Romes history spans more than 2,500 years, while Roman mythology dates the founding of Rome at only around 753 BC, the site has been inhabited for much longer, making it one of the oldest continuously occupied sites in Europe. The citys early population originated from a mix of Latins, Etruscans and it was first called The Eternal City by the Roman poet Tibullus in the 1st century BC, and the expression was taken up by Ovid and Livy. Rome is called the Caput Mundi, due to that, Rome became first one of the major centres of the Italian Renaissance, and the birthplace of both the Baroque style and Neoclassicism. Famous artists, painters and architects made Rome the centre of their activity, in 1871 Rome became the capital of the Kingdom of Italy, and in 1946 that of the Italian Republic. Rome has the status of a global city, Rome ranked in 2014 as the 14th-most-visited city in the world, 3rd most visited in the European Union, and the most popular tourist attraction in Italy. Its historic centre is listed by UNESCO as a World Heritage Site and museums such as the Vatican Museums and the Colosseum are among the worlds most visited tourist destinations with both locations receiving millions of tourists a year. 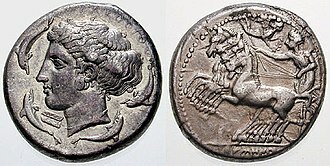 Rome hosted the 1960 Summer Olympics and is the seat of United Nations Food, however, it is a possibility that the name Romulus was actually derived from Rome itself. 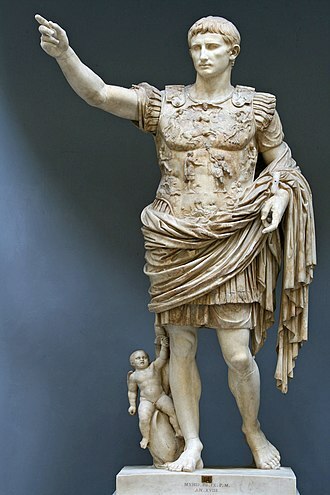 As early as the 4th century, there have been alternate theories proposed on the origin of the name Roma. There is archaeological evidence of occupation of the Rome area from approximately 14,000 years ago. Evidence of stone tools and stone weapons attest to about 10,000 years of human presence, several excavations support the view that Rome grew from pastoral settlements on the Palatine Hill built above the area of the future Roman Forum. Anne Lorne Gillies speaking publicly in the Scottish Gaelic language. Bilingual signs in English and Gaelic are now part of the architecture in the Scottish Parliament building completed in 2004. A sign indicating services in Gaelic and English at a Free Church of Scotland congregation in the community of Ness, Isle of Lewis. A 6th-7th century necklace of glass and ceramic beads with a central amethyst bead. Similar necklaces have been found in the graves of Frankish women in the Rhineland. Coronation of King Alexander on Moot Hill, Scone. He is being greeted by the ollamh rígh, the royal poet, who is addressing him with the proclamation "Benach De Re Albanne" (= Beannachd Dé Rígh Alban, "God Bless the King of Scotland"); the poet goes on to recite Alexander's genealogy. By Alexander's side is Maol Choluim II, Earl of Fife holding the sword. 9th century St Martin's Cross on Iona. Satellite image of Scotland and Ireland showing the approximate greatest extent of Dál Riata (shaded). The mountainous spine which separates the east and west coasts of Scotland can be seen. William "Rufus", the Red, King of the English, and partial instigator of the Scottish civil war, 1093–1097. The ruins of Kelso Abbey. This establishment was originally at Selkirk from 1113 while David was Prince of the Cumbrians; it was moved to Kelso in 1128 to better serve David's southern "capital" at Roxburgh. 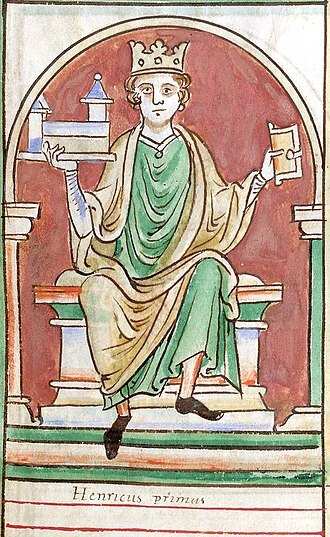 King Henry I of England, drawn by Matthew Paris. Henry's policy in northern Britain and the Irish Sea region essentially made David's political life. Coat of arms of Alexander II as it appears on folio 146v of Royal MS 14 C VII (Historia Anglorum). The inverted shield represents the king's death in 1249. The blazon for the arms was Or, a lion rampant and an orle fleury gules. David I (left) with the young Malcolm IV (right) depicted on the charter to Kelso Abbey. The reverse of the seal of Alexander I, enhanced as a 19th-century steel engraving. Lerwick Town Hall stained glass window depicting "Margaret, queen of Scotland and daughter of Norway"
A Syracusan tetradrachm (c. 415–405 BC) Obverse: head of the nymph Arethusa, surrounded by four swimming dolphins and a rudder Reverse: a racing quadriga, its charioteer crowned by the goddess Victory in flight.